There’s something rather wonderful about the aroma that wafts out from a good box of chocolates when you lift the lid off. Hotel Chocolat never fails to disappoint in this regard. This beautiful gold box, embossed with coppery gold oak leaves and acorns, is the Autumn Sleekster. It’s just made its way onto the shelves in time to help us through the shortening days. The Autumn Sleekster contains 27 chocolates with the comforting tastes of mellow fruitfulness. I found walnuts, crumble, pecan pie and banana bread. As always with Hotel Chocolat, there are new chocolates to get excited about amongst some familiar favourites. Salted caramel is my top chocolate and the one I will always hunt for first. Thankfully it’s not been forgotten here. No good chocolate selection box is complete without at least one, I reckon. This autumn sleekster not only has two salted caramel pecan pies, but also two salted caramel vodka chocolates. Oh joy! The salted caramel vodka is warming and sumptuous and the flavours linger on for some time after eating. This makes for a particularly satisfying experience. I was delighted to find an autumnal apple crumble. You really can’t have a self-respecting autumn collection without one of those. It may be a little different from the blackberry and apple crumble I recently posted, but you definitely know what you’re getting. Tart apple alongside spiced caramel sits in a dark chocolate cup with a little crunchy crumble on the top. I was a little surprised to find that the Banana Bread was one of my favourites. Banana bread is lovely of course, but you don’t expect it to feature in a box of chocolates. It has crunchy walnuts and hazelnuts with banana and just a hint of cinnamon in a milk chocolate shell. For CT, who is rather fond of coffee flavoured chocolates, there were a couple of Tiramisu which kept him happy for a while. With a choice of whipped mousse, chewy florentine, marzipan, pralines and dark chocolate, to mention but a few, there is something to suit every palette. The colours of the chocolates are mostly dark oranges and tans to reflect the seasonal colour, as is the box, which is why I find it so appealing; I think I’ll have to keep it. The nuts, spices, alcohol and general warm coziness found in the chocolates make this a box to dip into after a bracing walk through the autumn leaves. Snuggle up and enjoy. Sorry Denmark, but who needs hygge? The Autumn Sleekster is available at Hotel Chocolat retail outlets or online. It retails at £22.50. I was sent the Hotel Chocolat Autumn Sleekster for review purposes. I was not required to write a positive review and all opinions are, as always, my own. 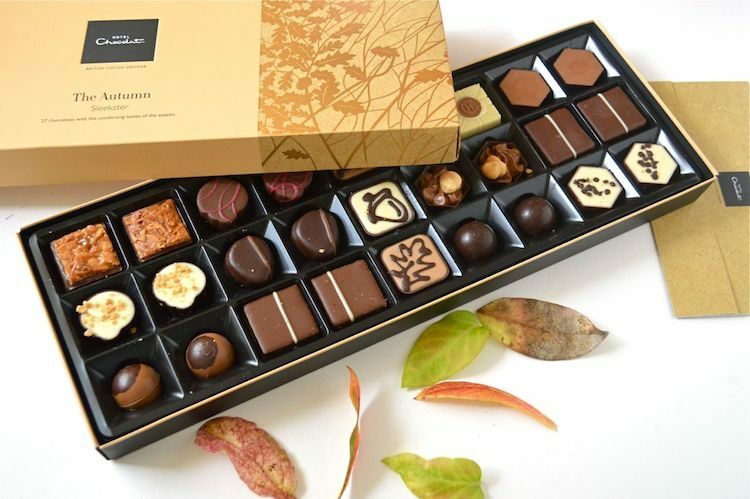 Hotel Chocolate is kindly offering one Tin and Thyme reader a Hotel Chocolat Autumn Sleekster box worth £22.50. To be in with a chance of winning, please fill in the Gleam widget below. You will need to leave a comment on this post, answering the question, which then gives you additional chances to enter if you so wish. Gleam will pick a winner at random from the entries received who will then be contacted via e-mail. If you are commenting anonymously, please give me some way of identifying you as I will be verifying the validity of entries. Any automated entries will be disqualified. This giveaway is only open to those with a UK postal address. Winners will need to respond within 5 days of being contacted. Failure to do this may result in another winner being picked. There are no cash alternatives. The Autumn Sleekster is offered and provided by Hotel Chocolat and Tin and Thyme accepts no responsibility for the acts or defaults of said third party. Tin and Thyme reserves the right to cancel or amend the giveaway and these terms and conditions without notice. Do take a look at the Tin and Thyme giveaways page to see if there’s anything else you’d like to enter. You can find other competitions at The Prize Finder and Loquax. My favourite thing about autumn is watching the trees gradually change colour. One in the garden turns to the colour of pure copper before the leaves drop – it’s a beautiful shade of brown. Outside, in the crisp afternoon air, seeking conker treasure hidden in discarded golden leaves. Inside, curled by the crackling fire, with my autumnal Hotel Chocolate treat. Autumn is sweet! Ooh, I didn’t know Birmingham had a chocolate festival. Thanks for letting me know. Autumn is amazing, the crisp sharpness of the air, the leaves falling, the conkers and acorns on the ground, and getting cosy inside when it is battering rain outside. Wrapping up in a warm jumper, drinking warm coffees and hot chocolates and watching the colours of the beautiful leaves changing! Wrapping up warm, darker nights all cosy at home. The run up till Christmas begins! My favourite thing is reaping the harvest from our apple and pair minarettes, and getting out into the cooler, fresher air to get the garden ready for winter! My favourite thing about autumn is the myriad of beautiful colours – all shades of ochre, russett and gold…beautifully captured by Hotel Chocolat’s Autumn Sleekster. My favourite thing about autumn is the change in the leaves on the trees and the beautiful colours. My favourite thing about Autumn is the clear crisp air which sweeps into my native North East. I love the cool crisp Autumnal morning when it is bright and sunny but cool. I also love seeing the coloured leaves on the trees and searching for conkers with the kids! I really like cosy nights in and lovely home-cooked family dinners, we just had hotpot last night was amazing! I also like the Autumn TV schedule and the run up to Xmas! i love wrapping up warm and going out for a walk or feed the duck and love warming up with hot chocolate even more! That crisp smell in the air reminding you that winter is coming! The changing colours and the chill in the air and the feel of Christmas on it’s way. The changing colours, picking blackberries and sloes, shuffling through fallen leaves, nice empty beaches to wander on. The weather turning colder and starting to have the fire/heating on! My favourite thing about autumn is the lovely warm colours everywhere, the rich reds and oranges on the trees. Everything looks magical. Walking through crisps leaves in my boots, snug as a bug taking in the fresh autumn air! A brown surprise I once found upon the ground upon a wondering path. And at my back were giggling kids with bags full of autumns treats. Hours of fun with a simple string had kept me full of fun. But now I’m old – all I want – is a Hotel Chocolate treat. Going on dog walks through the woods, in my wellies, kicking through the autumn leaves and enjoying the warm displays of colour. bonfire & fireworks night, i just love the smell in the air! <3 also halloween! I love the way the air and colour changes. I love being able to add beautiful scarves and hats to my outfits. I love being able to snuggle down with a pot of tea and chocolates while reading a good book. I love the chillier days when you get all wrapped up and go for a dog walk in the forest, where you look for chestnuts and crunch through fallen leaves. i love autumn walks, all the different colours, the darker evenings and time spent snuggling by the fire! i also LOVE halloween! I love the cooler days , the beautiful leaves and making my home cosy with throws and candles. I love Hotel Chocolat, I even love the box on these, how pretty is that? You know it’s Autumn when there is loads of snooker on tv. Getting all my favourite coats out! I love to see all the changing colours of the fields and trees,it looks so interesting,I always wish I was an artist so I could paint it. I actually love the nights slowing drawing in! I love the earlier darker nights, also it’s a nice calm before the storm in regards to Christmas! I love all of the Autumnal colours! My favourite thing about autumn has to be seeing the leaves fall from the trees then watching the children play in the leaves. Ooh, roasted chestnuts. What a lovely thought Ginny. I love the early dark nights, I love to be cosy! I love being able to wear all my jumpers again! I love the crisp sunny mornings, and Halloween! Bonfire night is great fun too! Autumn is my favourite season! I love the darker nights, lighting candles, staying cosy, new slippers, autumnal walks with falling leaves, eating apple crumble….it’s all just wonderful! My favourite thing about Autumn is the changing colours of the leaves. The changing colours, the crisp mornings, shuffling through crunchy leaf-drifts, the grey clammy enveloping misty coldness, snuggling up in the evenings. Hot soup on cold country walks! Chunky knitwear and tall boots. The fresh scent of the cool air. The particular light you only seem to get on clear sunshiny autumn days…. ah, Autumn. In case you hadn’t guessed, it’s my favourite season! My favourite thing about autumn is getting dressed up and going trick or treating with the kids on Halloween. My favourite thing about autumn has to be all of the different colours of the leaves on the trees and on the ground. I love going walking out in the country. The autumnal colours are so beautiful – I always take my camera with me. Chocolate rules. Nice gift. Hope to win. We have a huge travelling fair which comes to our city every October. It brings back great memories from my childhood. In autumn I love foraging for things like rosehips, sloes and rowan berries and making lots of jams, jellies and chutneys. Ah, a woman after my own heart Barbara. Only I’ve not managed a great deal this autumn – oops! I love snuggling up watching movies, crisp walks over the weekend and a nice slow cooked casserole ready after a busy day. My favourite thing about autumn is watching the trees change colour and feeling all snug with the wood burner going. Autumn is my most favourite season. Vegetables, warming ones, are at their best. But mostly it’s alllllll about the foraging! Absolutely love hunting for mushrooms and getting lost in the woods. Am off hiking in the Peak District this weekend to celebrate! Without a doubt… the comfy, cosy nights and opportunities to get together with people over a hot chocolate, mulled wine, good chat and comforting Autumn foods. Its a time to relax, take stock and enjoy the simple pleasures in life. Sunny days, more like spring than the impending winter weather. Plus the clocks going back, an extra hour in bed! I love how it starts to get chilly, perfect excuse to cuddle up and get warm! I love the changing colours of the leaves on the trees. The cooler weather, being able to snuggle up both inside and out, the magical changing leaf colours and being able to wear jumpers again. I like the colder fresher mornings, and the leaves falling from the trees, very therapeutic. I like all the different colours of the trees. I love the darker mornings . I love absolutely everything about Autumn! In particular I enjoy celebrating my wedding anniversary and my son’s birthday. I love walking home in the crisp air in a big snuggly jumper to open the front door to the smell of a warm strew that has been bubbling away all day. The chocolates would be a great pudding! Conkers, cosy knits and the gorgeous autumn colours – such a nice season! I love the smell of the air, the feeling of stillness and the autumnal themed food and fashion. I love being able to wear my leather boots and coats in the colder autumnal weather! I love the changing landscape colours. I love autumn all the beautiful colours of the leaves and the darker nights snuggled in front of the wood burner. Baking with apples and cinnamon, the rich colours and hazy autumnal sunshine. The darker nights drawing in, snuggling up in front of the fire. The fresh air, the leaves changing & the wool jumpers! I love roasting marshmallows over my fire pit in the back garden. Wearing chunky jumpers with skirts, boots and thick tights again – hate getting my legs out in the summer! Autumn is my favourite time of year because it is so pretty outside – love seeing all the orange colours in the park. It’s also my partners birthday and my birthday in October. We love to cosy up on chilly autumn nights and watch a movie with out hot chocolate! I love how the leaves all fall and when you walk over them there is a lovely crunching sound! I love collecting conkers and walnuts, seeing the leaves changing colour and falling to the ground. We go leave kicking which is fun for the little ones. I love the fact that as the nights are darker and colder the kids want to stay in and we have more family evenings. I know this probably makes me strange, but I actually like the fact it’s getting colder! A crisp breeze in the morning when I’m on my way to work helping to wake me up. I love the changing of the colours of the trees, getting to wear scarves again and not having to wear sun cream! Hahaha, not strange at all Lizzie. I’m with you on all of that – if only it would stay dry! I love the start of Autumn when the trees start to change colour. Staying in and snuggling on the sofa to watch a movie. Love the cold mornings followed by warm days, the change in the air and light, the trees changing colour, picking blackberries, sloes, nuts and maybe the odd puff ball. Ooh yes, puff balls. We haven’t managed to find one of those for a couple of years now. Crossing fingers we’ll get luckier this year. I love bonfire night, all the colours it brings & the warmth from the bonfire. Snuggling up to watch lots of great tv, with a cheeky hot chocolate drink! I agree Lorraine, autumn is definitely the time for hot chocolate. I like Autumn because you still see the sun and can still sit out in the garden if you’ve got something warm on, although I’m much more a Summer person. I love the cosiness of the early dark evenings, lighting candles and the spookiness of Halloween. All the autumn colours too are just gorgeous. The changes in the garden, the planting of new bulbs and the visible changes in the behaviour of the wildlife. My favourite thing about Autumn is getting outside to brush up leaves. Sounds wonderful Clara. Love the New Forest and GBBO of course. It seems we’re all taking to the Danish idea of hygge with enthusiasm. I like to take the dogs down the river and kick through the leaves. I find Summer too hot and too short, winter too cold and long. Autumn can be still warm and bright, We love picking conkers for keeping spiders away, I start baking more pies and crumbles from the fruits and veggies I’ve harvested. I also like it because I look forward to Halloween, not the commercial one but the pagan one. and I love the smells on bonfire night. Lots of good reasons for liking Autumn there Theresa. Yes, I feel it’s rather sad how commercial Halloween has taken over. Apart from the changing colours of the landscape,I love building a big pile of leaves and jumping in it with the grandchildren! I like that it starts getting colder, so I can wear autum/winter clothing, which I prefer to summer/spring clothing. I like the soft, snuggly fabrics! My favourite thing about autumn is getting wrapped up in my favourite scarf nd wooly jumper, as the mornings start to get cold and fresh! My favourite thing about autumn is the first time we put on the log burner at home. My favourite thing about autumn is wrapping up warm and going for a walk in the cool, crisp air with the crunch of colourful fallen leaves underfoot. Getting all cosy in lovely new autumn clothes and boots! A wild winter night by the sea in my motorhome and homemade curry. the leaves falling looks lovely and looking for conkers then we can play with them after ! My favourite thing about Autumn is watching the changing colours of the foliage whilst cocooned in achunky warm clothing. Lots of good new TV programmes start in the autumn. i normally love to watch the changing colours of the leaves however this year we move house just before the clocks change so it will be being able to come home, close the curtains and light the real fire. i’ll spend the evening watching the fire rather than the tv i think! Making pumpkin and butternut squash soups, collecting conkers to stop spiders and lighting my fire. The various shades of the Autumn leaves and the crunching sound that they make underfoot. I like Autumn weather. Not too cold, not too hot. Just right. I love autumn as I can start having fires in my stove to drive away any damp air, gather apples, clear the garden and enjoy any last rays of sun. I love all the wonderful colours of the leaves on the trees. My favourite thing about Autumn is all the different colours of the leaves. It is so beautiful. You’re making me feel very hungry! I love the walks through the golf course and watching the golfers not being able to find their balls under all those leaves! I love the crispness of the morning air and the leaves crunching under my feet. My favourite thing about autumn is the colours – russet leaves and dusky sky. I live in Cornwall so the best thing about Autumn is getting the beautiful beaches to yourself! Haha, I’m with you there Karen, although it’s harder to get them to yourself these days I find. I love walking in the park on a bright sunny Autumn day when the leaves which have changed colour almost seem to be glowing. I like going into hibernation mode, turning the heating on, watching great TV dramas, and wearing snuggly jumpers…I’m not a fan of Autumn outside! I like collecting conkers for no other reason than I like the colour of them. Big piles of leaves and the chance to get the garden finished for winter – i.e. no more mowing! watching someone else picking up all the leaves in my garden!! I actually like it getting colder, and I like the quality of light to Autumn. And Halloween, my favourite sweetie festival. My partner decorates the front window, and I love giving out goodies to any witches and ghosts who come calling. I love going for long walks on a sunny afternoon and specifically going where there are lots of fallen leaves so I can crunch through them – really makes me feel that Christmas is coming. I love putting the heating on and the fire i also love the crisp mornings for the walk to school crunching all the leaves on the way! I love Autumn because I live in the heart of the Pembrokeshire Countryside, so I get to witness the roads change colour – thanks to the leaves falling. The white crispy grass on my morning walks and the thought of Christmas around the corner! I can’t wait to get my wood burner up and running and fill the house with the smell of homemade Mince Pies! I love the autumn colours, kicking through the fallen leaves; the smells of warming soups and stews; curling up with a book and yummy chocolates! Watching the hedgehogs in our garden make their hibernation nests. I love this time of transition from summer to winter. Still lots of flowers in the garden, but day by day everything is going into a slower pace. Colours fade and change and fall. Baking is dictated by the autumn harvests (apples and pears) and the longing for other, denser and warmer tastes and smells (more spices, more chocolate, more nuts). This week I’m going to make a chestnut-cream-chocolate layer cake, covered with marzipan and more chocolate. Perfectly put. I think I rather want a slice of your chestnut cake – sounds wonderful. Sorry, I can’t read instructions obviously and thought you said 10 words maximum! Oops. My favourite thing about autumn is curling up in front of the fire, reading a good book, while a delicious homemade stew is cooking in the slow cooker, filling the house with yummy smells. My favourite thing is winter clothes! My favourite thing about autumn is snuggling up on the sofa with blankets and hot chocolates watching movies, and of course bonfire night! I love the colours and the leaves feeling crisp underfeet, not cold but cold enough to wrap up warm and stop for a warming hot choclate while out and about. I love watching the leaves turn colour and the autumn berries that come out. Oh it has to be the cool autumn breeze. Not horrible like winters, but refreshing, when you walk in it. Bike rides through forests as the leaves gracefully fall to the ground and the trees fly by. I love getting wrapped up and going for a brisk walk! I like to go for a walk in the countryside on a sunny autumn day. Love the leaves on the trees changing colour. Autumn signifies the beginning of my favourite weather. The kind of weather where I can spend my nights snuggled on the sofa with my partner, in big fluffy socks and drinking hot chocolate while watching movies! I love the festivals – Bonfire Night and Halloween – always good fun! Love the Autumn leaves and garden bonfires. Seeing the amazingly beautiful myriad of colour in the leaves of the trees is my favourite thing about autumn. I love the autumnal colours and being able to watch the rainy weather from the comfort of my home. I love our local village Bonfire Night displays – my kids enjoy them too! I love the beautiful autumn colours. We have a bush in the garden, which looks pretty boring all year, then in autumn it suddenly turns bright red and looks absolutely amazing. It only lasts about two weeks, then the leaves fall off almost overnight. I like to make the most of looking at it for that precious fortnight. The best thing about Autumn is the turning colours of the leaves. I love to see the leaves changing colour, the variety of colours and the richness that only autumn brings. My favourite thing about autumn is jumpers and the leaves changing colour! Taking my dog for a cold walk to see all of the bright leaves. Getting wrapped up and going for a nice walk Then walking back into the house seems so warm and comfy! My favourite thing about autumn is finding chestnuts under the most beautiful trees and being able to roast them in the oven. My favourite thing is the colder weather; I get to wear my onesies! I like the crunchy leaves and it being a bit cooler after summer is too hot. I love being able wear boots and also curling up on the sofa in the warm after a bracing walk. don’t have 1 favourite thing but I like Halloween as its a fun time of dressing up and I enjoy bonfire night. We always have fireworks and hot dogs and soup! I love the change of leaves, the beautiful sunsets, the slight chill in the air and the feeling of no guilt for having a yummy white hot chocolate at night to feel warm! love being able to snuggle up with a movie, blanket and hot chocolate, and going for walks with the crisp leaves on the floor….and it means christmas is soon here! I love being able to snuggle up with a warm latte after arriving home from work and second to that the colours of the trees are amazing. I love the changing colours of the leaves, wrapping up warm, cozy nights in, comfort food, lighting some candles and curling up with a good book, forgetting the diet for a few months! I love the fact that the summer has ended, I hate it when it’s too hot. Nice long walks without getting too hot and cosy evenings at home. I love the colours, the crisp air, and crunching through the leaves with my dog. The beautiful colours that the trees go! My favourite thing about autumn is the kids going back to school!! Hehe, that made me laugh Ashleigh. My favourite thing about autumn is reentering soup season 🙂 and all the lovely seasonal vegetables which can be used to make delicious homemade soups! Thanks Victoria. Sadly, I seem to have chocolate cravings more often than not! Getting to wear snuggly jumpers!! We love to crunch the leaves under foot and hunt for conkers! My favourite thing about autumn is that I can move into my cooler weather clothes. I never know what to wear to work in hot weather but in autumn and winter I can wear my dresses and thick tights. I agree Angela. Cooler weather is much easier for clothes. I really enjoy settling down in front of the television watching all the good new dramas in an evening. Snuggling up in the warm and live X Factor shows and the run up to Christmas. My favourite thing about autumn is long walks through woodland with all the leaves on the trees. Dusting your old winter coats and starting to wrap up warm. One of the best things is that feeling when you turn the heating on for the first time and the warmth of the house makes you feel all cosy and snuggly inside! I love walking through crisp frosty leaves with my dog. I love the colours, the smells, the food… Walking in crisp clear air amongst the artistic show put on by nature, collecting conkers, roastng squash, and making pumpkin pie! I love colder weather. I love to wrap up warm and walk through the crunchy leaves with my dog. Hats, gloves and steaming breath – perfect! I love conker picking, we always do it around my dad’s birthday so it’s become a family tradition. My favourite thing about Autumn in the leaves changing colour and conker collecting. I love seeing all the changing colours in the trees, crisp sunny days and cosy evenings in front of the log burner! Favourite thing about Autumn is the late break we have as a family. Its a tradition that we stay in a lodge with a hot tub and a log burner in November and chill out and go for long walks. I love that fresh clean smell in the air and jumping and kicking the crisp leaves with my boys!! I love getting out and crunching through the colourful autumn leaves. In Autumn I really enjoy the cool, crisp sunny days. Perfect for a stroll in the countryside. The myriad shades of oranges and reds as the leaves change colour before shedding, to leave the trees bare for the winter, eating apple and blackberry crumble, made from the fruits of the autumn harvest and sitting in front of a roaring log fire as the evenings draw in. My favourite thing about autumn is looking forward to all the chocolate I am going to eat at Christmas. The best thing about autumn is that although winter’s on it’s way it hasn’t arrived yet .there’s still a little time before SAD sets in with a vengeance. Love the colours of the leaves and everything feels fresh. I love the changing colours of the leaves on the tree and the falling conkers!! I love all the beautiful colours of autumn, especially the reds and oranges as the leaves begin to fall. Favourite thing about autumn is the changing colours of the trees where we live in the Kent downs, so many amazing walks to do! Forest walks followed by home-made soup. The many colours of autumn in the sunlight on a cool clear day. My favourite thing about Autumn is the chance to cook hot, hearty meals out of the slow cooker. Casseroles, Stews, Curries, using fresh seasonal ingredients, that serve to make the dark evenings at home and the walks in the cold weather a happier place to be. I just love the colours, it turns our surroundings into something stunning to look at. Keeping warm at home, getting snuggled down & watching great films with family. My favourite think about autumn is not having to do as much ironing as most of the time I wear jumpers, so no-one sees what’s underneath. My favourite thing about Autumn is the leaves changing colour. That and being able to wear boots again – I hate wearing sandals. My favourite thing about Autumn is the cool crisp air in the morning. It is so refreshing to walk the dogs and see the mist roll over the fields and hear the leaves under foot. I love the smell of bonfire smoke so I’m very content in Autumn when always seems to smell like that where I live. I also love the colder weather because it means jumpers, boots, coats and scarves..basically a reason to go shopping for new warmer things! My dogs love running through at the fallen leaves in Autumn! Walking home from school with the kids across the park, going conker hunting on the way home!! Autumn walks when the air is crisp but the sun is shining, with a hot chocolate to warm up after! The colours of the trees – gold, orange, red, some still green. All together they look amazing, and it’s for such a short time. I enjoy it while I can! Hotel Chocolat make the most amazing chocolate – they are my absolute favourites! My favourite thing about autumn is the leaf colours – I have Virginia creeper on my house and it looks amazing in the autumn. Oh, how wonderful Cathy. It looks spectacular at this time of year. The colours of the leaves and Halloween! Walking my dog in the woods and kicking up all the colourful leaves! I love the cooler weather. No more hot and sweaty nights sleep.